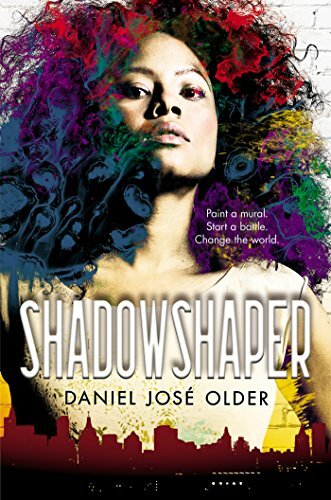 Shadowshaper is an urban fantasy novel by Daniel Jose Older. Sierra Santiago has been hired to paint a mural at a Brooklyn junkyard. She enlists the help of Robbie to get the mural finished. Sierra learns that she and Robbie are shadowshapers. They can use their power to make their paintings come to life. Sierra’s mother doesn’t want to discuss it. Her grandfather is unable to speak about it. Her brother knows very little. So it’s up to Sierra to figure out how to use her power. Time is running out and she needs to defeat her adversary, Dr. Johnathan Wick, before he ruins shadowshaping. This book had really vivid imagery. You can imagine the paintings coming off of the walls. At first, I couldn’t remember what it’s called when the writer writes like people talk. (Seriously, I had to Google it. The answer is voice.) The characters in this book definitely use their voice. There is some discussion in the book about racism; however, it’s a Latino and black conversation. Sierra is Afro-Puerto Rican. She gets a lot of crap from her aunt about her hair and skin. When Sierra starts dating Robbie, who is Haitian, she has an argument with her aunt. Sierra stood up for herself. I was really proud of her. Then I remembered that she wasn’t real. So it’s fair to say that I enjoyed this book. I was so happy to see that there is a good chance of the book being made into a movie.